Our week's academy award foreign film stars one of my favorite actors of all time, Gael Garcia Bernal. 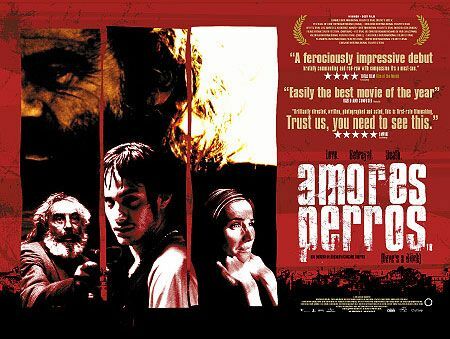 Amores Perros is 'Love Dogs' in English. There are three major stories running that are centered on three characters: Octavio y Susan, Daniel y Valeria and El Chivo y Maru. Their stories are all entwined with dogs. It's great storytelling and great story. That's what makes the movie gripping. Octavio (Gael Garcia Bernal) y Susana (Vanessa Bauche) live in the same house. Susana is Octavio's sister in law but he likes her secretly. This emotion is heightened as Octavio sees that his brother, Ramiro, treats Susana like crap. He confesses his love and asked her to leave with him. To earn money, he gets into dog fighting. Something happens that Octavio crosses paths with Daniel y Valeria. Daniel (Álvaro Guerrero) and Valeria (Goya Toledo). Daniel left his wife to live with Valeria, a model. Valeria injured her leg and then loses her dog which she believes is under the floor. She insists on rescuing the dog which Daniel disagreed with. They start to fight. These fight causes for Valeria's condition to worsen until it affected their relationship. Daniel is forced to re-examine why he is even in the relationship. El Chivo (Emilio Echevarría) and Maru (Lourdes Echevarría) are father and daughter but were separated when El Chivo wen to jail. He is a professional hitman. In his effort to try and reach out to Maru, he gets into an active that involved all the other characters. their paths cross and their life changed but this change all leads to the conclusion of their story. Importantly, no character sank. Each character were given equal importance and sympathetic that it didn't matter how they try and fulfill their objectives. As an audience, you will just find yourself rooting for all of them, no matter how damaged their character is. I have always been a Gael Garcia Bernal fan and he didn't disappoint in this movie. You can feel his character, his desperation and passion. However, it is not just him. The whole cast worked together. Each character allowed other characters to be complete. They complemented each other. The result is a convincing movie with most sympathetic damaged characters. Truly one of the best academy award foreign film of all time.